It's amazing how much seemingly minor things, things that never occurred to me before I moved to Australia, matter so much in determining my quality of life. There is a trend right now for "open plan" offices in academic environments. The idea seems to be that by preventing people from being in small offices, and instead having a desk in a large room with many, many other people, you foster communication and collaboration. I have worked in both small offices and large, open plan offices and in my opinion this is complete baloney. Offices are for doing work, which often requires concentration and a lack of disturbance. In my experience, open-plan offices just breed frustration and resentment for one's co-workers and ultimately creative ways to isolate one's self in a crowded environment, such as wearing headphones, erecting blinders around your desk, and even not coming in at all and instead working from home. In the end that has the opposite of the intended effect: people, especially introverts, deliberately isolate themselves from the academic community at the university. Even a coffee shop is easier to work in than an open-plan office. At least at a coffee shop the din is constant and consistent and the people are strangers - very unlikely to break your concentration by coming up to talk to you. I am being a little too harsh here, I've worked in open-plan offices that work well, but these have false walls (basically, cubicle walls) that give you a little privacy and the desk space allotted to each individual was large enough that we weren't touching elbows all the time. So what does, in my opinion, foster collaboration and camaraderie? Common areas. Nice, welcoming places that you can go to eat lunch, look over a paper with your colleagues, or have a meeting over coffee. These allotted areas are often looked down upon for being wastes of space, social areas where you can go to waste time, but again I think this is baloney. These are the areas were you meet the people you work with: over lunch, during a discussion group, or if you happen to be reading the paper at the same time as someone else. A common area to have lunch is important: if everyone leaves the building for lunch, people will arrange to go with their friends, and new people who haven't met anyone yet will often feel awkward and left out, simply because no-one yet has their phone number and it's always hard to remember to include everyone. And nothing breeds resentment for your coworkers like eating fish for lunch at your desk in a shared office. This I know from experience. Meeting people and building relationships in a neutral space is, in my experience, extremely important for fostering professional relationships and developing collaborations. When academic buildings have been designed in the past, it seems the architects have agreed. The building I work in at the Australian National University (ANU), the Banks Building, has a large indoor meeting/tea room and an even larger outdoor courtyard. The courtyard in particular has been a major contributor to both my job satisfaction and community-development within the Evolution, Ecology & Genetics department at ANU. The courtyard in the Banks Building at ANU as seen from Google Earth (left) and the second floor balcony (right). The primary reason the courtyard is such a large part of what makes me happy at ANU is not just because it is pretty (though it is). It's because this is the place to go for lunch and get a little vitamin D. I've met countless people from the department I wouldn't have otherwise met because they were looking for somewhere to eat their lunch and came to eat it outside with us in the courtyard. It's also the place were we have barbecues once in a while. 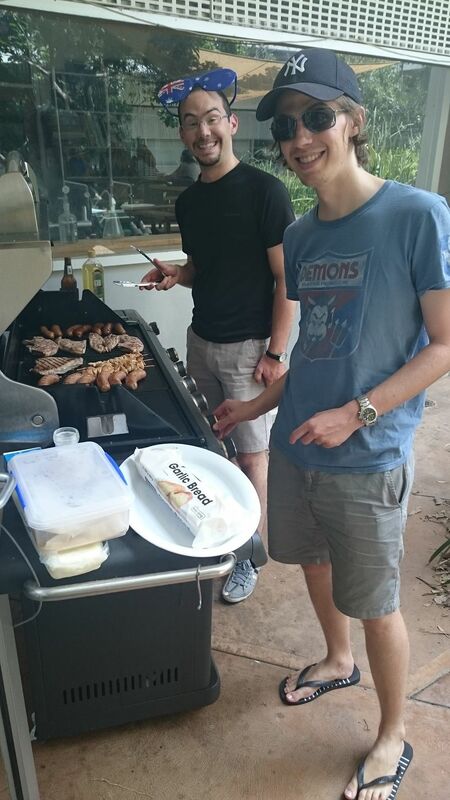 Barbecues are also excellent ways to celebrate milestones like thesis submissions, retirements, and Fridays. Having an eating area that's welcoming and large enough for everyone does wonders to foster these positive feelings towards our academic community at the ANU. This sense of community helps us all get along and also to do better science through collaboration and team work. THIS is how you get to know people and their science. Not with building a tunnel between two buildings, not with open-plan offices or labs. I've been to many working environments that have tiny, gross, entirely unwelcoming common areas that are completely unsuitable for meeting people. These places are also often filled with people who complain about feeling isolated and alone at work (in my experience, at least). Our courtyard in the Banks Building at ANU is a great place for meeting people and fostering community and collaboration. Here we are celebrating... something... (possibly a thesis submission*) on the left and in the middle, and meeting in the morning sunshine on the right. Photos kindly provided by Cat Young (who's soon getting married to the guy in the picture on the right, which I cannot, even though I would love to, credit to meeting in the courtyard). The courtyard is a particularly wonderful common space because the trees and pond within encourage the presence of wildlife. Several of the wild animals mentioned in this post about wildlife on campus have been seen in the courtyard. Particularly, the large Banksia tree in the courtyard has been home to both ringtail and brushtail possums, and its flowers and seeds attract a wide variety of animals including flying foxes, honeyeaters, and at least five species of parrot (including my favourite, gang-gangs). For about a year a pair of ringtail possums decided a notch in the Banksia tree was an ideal bed, and we'd check every day to see if Yoda and Yodette were around. Word quickly spread amongst us if they were. Later, a possum nesting box was affixed to the tree and ever since we've had a rotation of brushtail possums using it, including one memorable female with her baby. 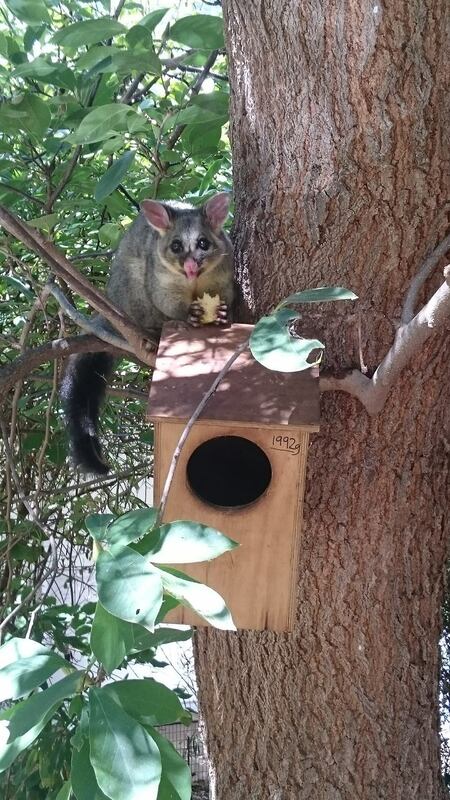 The more confident possums will even come out of the nesting box at lunch time to try and steal a midday snack. Brushtail possums have been occupying the courtyard since a possum nesting box was installed. Photos by Cat Young. In addition to the wild animals that wander through, our courtyard is home to some departmental "pets". They are mostly unwanted pets that we've accumulated over the years. These are species that live in the local Canberra area, and are therefore perfectly happy to live in the courtyard year-round. Though we greatly enjoy having them around, they seem to be even more appreciated by visiting scholars, especially those from overseas, for whom they provide a way to see some local wildlife while having meetings about science. This is advantageous because scientists are busy people and often only visit for one or two days, not long enough to squeeze in some wildlife viewing on top of all the meetings. In our courtyard we have quite a few native animals wandering around which often crawl over their feet while in the midst of technical discussion. The slight loss of productivity and focus is mitigated by the increase in joy. 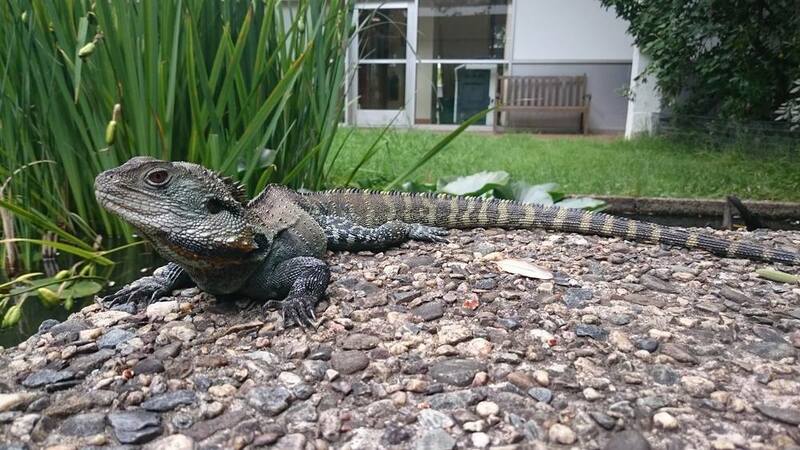 The most charismatic "pets" living in the courtyard are the Gippsland water dragons. There were eight dragons in the courtyard last time I counted, seven of them male. Each male has their own territory, but they all want the same territory: the one which contains the picnic tables at which we eat lunch. Whichever dragon holds this territory gets a free lunch almost every day. The free lunch also attracts the courtyard's only female dragon, allowing the territory's male exclusive access to her. For years this territory was held by Stumpy, the oldest male dragon, who bore the scars he got keeping his prize territory. However, last year Stumpy got too old and fell from grace: there was huge upheaval amongst the courtyard dragons (this is starting to sound like Game of Thrones) and a new, young upstart beat Stumpy in battle and took the female and free lunches for himself. Stumpy the old dragon king on the left and his young usurper on the right. Photos again kindly provided by Cat Young. The dragons aren't the only ones we share our lunches with. If a brushtail possum is around it often gets some (see photo above right), and the courtyard's resident bluetongue skink also partakes. 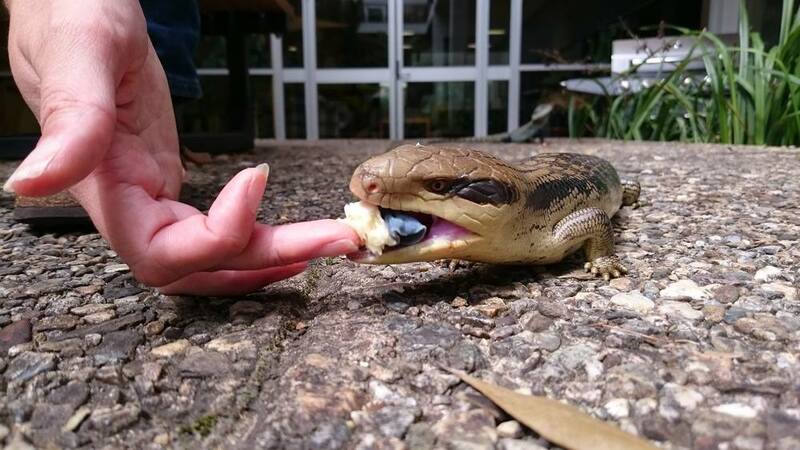 Possums and dragons are quick and agile enough to steal food when we aren't looking - the dragons have even been known to climb unsuspecting legs to grab a meal - but the bluetongue is neither quick nor agile and has to wait for handouts. Of course we are quite fond of all the animals and generally handouts are provided all around. We often share our lunches with the courtyard "pets", including the dragons (left and centre) and the bluetongue skink (right). Left and centre photos provided by Rose O'Dea, right by Cat Young. In the courtyard's centre is a large pond which provides habitat for its more aquatic residents. Two species of turtle reside in the courtyard pond: eastern long-neck turtles and Murray River short-neck turtles. The turtles are a great weather-prediction system: if they're out of the water and wandering around, it's likely to rain that day. They're also rather joyful: they constantly look like they're smiling at you. The turtles, like the lizards, are used to being fed by people, and as a result are rather friendly. If you approach the pond they'll often come to greet you to see if you have any yummy liver treats for them (they're fed raw cow liver). Smiling Murray River short-neck (left) and eastern long-neck (right) turtles inhabit the courtyard pond. Right photo once again kindly provided by Cat Young. 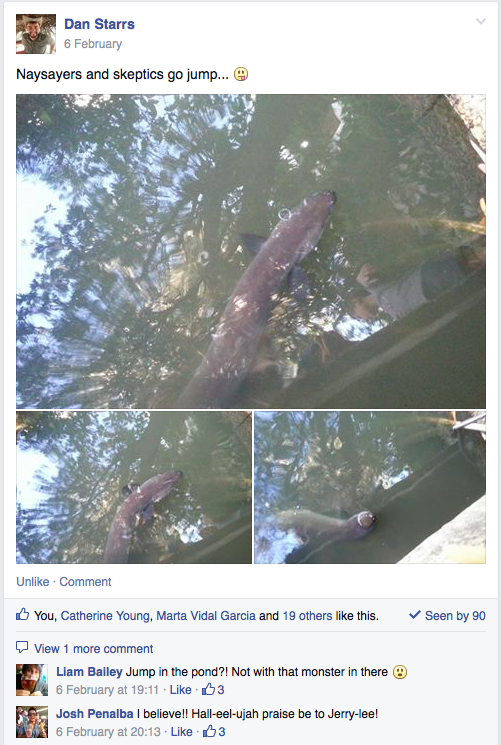 One courtyard resident has attained mythical status in our department: Gerry-lee, the courtyard eel. Many believed he did not exist. There were very few sightings of him after he was introduced to the courtyard in 2012, and most thought he was either someone's joke or had died. Those who claimed to have seen Gerry-lee could not provide proof. I myself had seen him only a handful of times, and had never been successful in photographing him. So most remained disbelievers up until earlier this year when our department's resident freshwater fish expert managed to take three pictures of Gerry-lee, proving his existence once and for all. Gerry-lee the courtyard eel, who we are all now sure exists. Photos kindly provided by the only person I'm aware of to have successfully photographed Gerry-lee, Dr. Dan Starrs. The ANU is not the only university to see the benefit in providing welcoming common areas, particularly courtyards. When I visited the University of Papua New Guinea last year I discovered their biology building also has a large courtyard. Being in a tropical country, their courtyard contained a spectacular mini-rainforest, complete with fawn-breasted bowerbirds and a bower! I've seen satin bowerbirds in the courtyard at ANU on a few occasions, but having a resident male with a bower would be spectacular. I also recently visited the University of British Columbia and discovered their biology department has a courtyard, and than they are committed to keeping it through upcoming renovations. Although the University of British Columbia is located on a sadly bowerbird-free continent, I did find out that their courtyard is visited regularly by the spectacular Anna's hummingbird. Courtyards are found in the biology buildings at the University of Papua New Guinea (left) and the University of British Columbia (right). I strongly feel that attractive, open common areas, such as courtyards, are essential to fostering and maintaining a collaborative, productive, efficient and happy academic atmosphere. And all these things are essential contributors to my overwhelmingly positive experience working at the Australian National University. One of Australia's most famous and charismatic animals is the thorny devil (Moloch horridus). It's famous because it looks cool, and because it's not all that easy to find. It's also the only member of the amphibolurine agamids that isn't referred to as a dragon. Although... dragon... devil... I can see a theme here. I am not a photographer. There are better pictures coming. Not that you can tell from that picture, but the thorny devil is a really weird, unique, beautiful lizard. Better views of thorny devils can be had by looking at Angus Kennedy's pictures from my 2012 field season. While Angus and Mitch were helping me catch dragons in the Northern Territory and South Australia we came across three thorny devils. This is the standard thorny devil pose that appears in pretty much all books about Australian reptiles and wildlife. Thurlga Station, South Australia, 2012. Photo by Angus Kennedy. The thorny devil lives in Australia's more foreboding habitat, the dry, arid interior, where water is a valuable commodity. Its scales are specially designed so that, when any part of the lizard comes in contact with water, that water is funnelled to its mouth through capillary action, the same process that gets water from the roots to the leaves of trees. This was such an incredible discovery that its original description was published in Nature, one of the most important scientific journals. Subsequently, it has been a continuing area of interest for biologists. A thorny devil at the entrance to an ant's nest. Thurlga Station, South Australia, 2012. Photo by Angus Kennedy. Other than the water-funnelling thing, there's not much known about thorny devils. A Google Scholar search for their scientific name turns up only thirty two results, many of which are observations of their basic natural history. They're famous for eating ants, and this paper has an adorable picture of one in "characteristic feeding posture" eating ants off the side of a tree. That so little is know about such a famous and charismatic animal is alarming; I can't even find population estimates for them. Unlike most dragons, the thorny devil ambles slowly. Thurlga Station, South Australia, 2012. Photo by Angus Kennedy. An additional theme I can see in the limited literature is that thorny devils are slow. In fact, in one of the most hilarious titles to a scientific paper I've ever seen, this article asks "is the devil a sloth?" Although we all know what the authors mean, and scientists are not without a sense of humour (well, most of us, anyway), sloths are, in fact, animals (mammals of the order Pilosa) and thorny devils are definitely not sloths. Thorny devils have a weird protuberance coming out of the back of their neck. Thurlga Station, South Australia, 2012. Photo by Angus Kennedy. There's a weird lump coming out the back of the thorny devil's neck. I've heard it said that this is a false head, and that if a thorny devil feels threatened it'll crouch down and stick up its false head for sacrifice to the predator. I can't find any evidence for this in the literature. 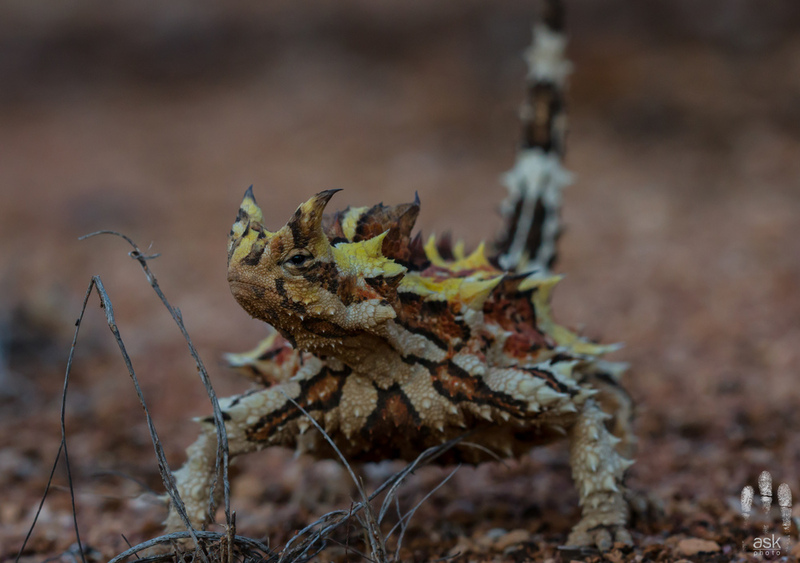 It is true that, when threatened, the thorny devil will crouch down and arch it back, but this is standard posture for animals that have spiky backs: it presents the predator with their least palatable body part. 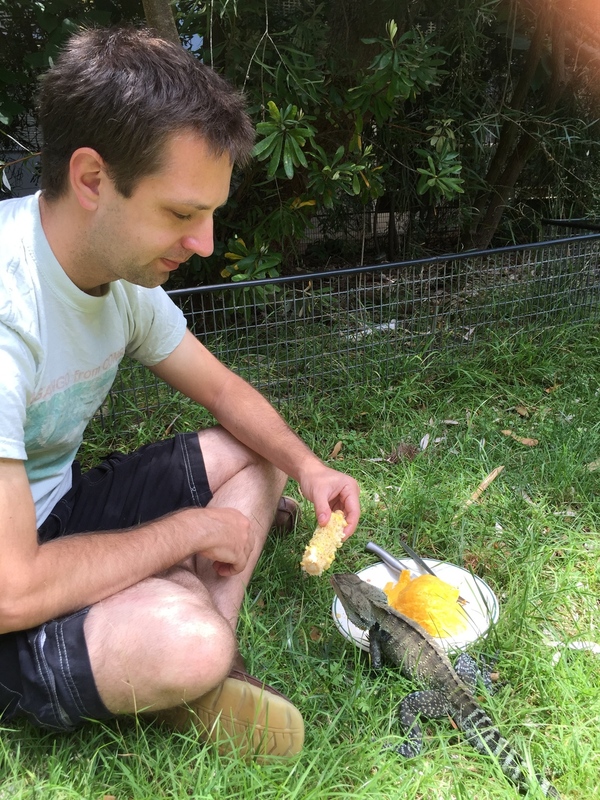 This behaviour can be seen spike-backed creatures like porcupines, hedgehogs, echidnas, lion fish, armadillo lizards and those horrible spiky caterpillars that curl up in a ball when you touch them. Furthermore, at an extremely informal poll at last year's meeting of Australian herpetologists, I couldn't find anyone who's ever seen a thorny devil without that weird lump. Geckos and skinks, which wiggle their tails to fool predators, are frequently found without tails, and have even evolved a mechanism for automatically detaching their tails and growing new ones. Not that I'm saying the false-head explanation isn't true, but just that I haven't heard of any convincing evidence. If you know of any evidence for the use of the weird lump, I'd be curious to hear it. Thorny devils are spectacularly coloured and patterned. Thurlga Station, South Australia, 2012. Photo by Angus Kennedy. Thorny devils are a good example of disruptive colouration. Their colours are the same colours as arid Australia, and they are patterned in such a way that it's hard to make out the shape of the lizard, especially if it's against a complex background. Of course, in these pictures, where we've deliberately placed the lizard against the homogenous backdrop of a dirt road, and it's easy to see. Thorny devils are the opposite of dolphins: they always look grumpy. Thurlga Station, South Australia, 2012. Photo by Angus Kennedy. 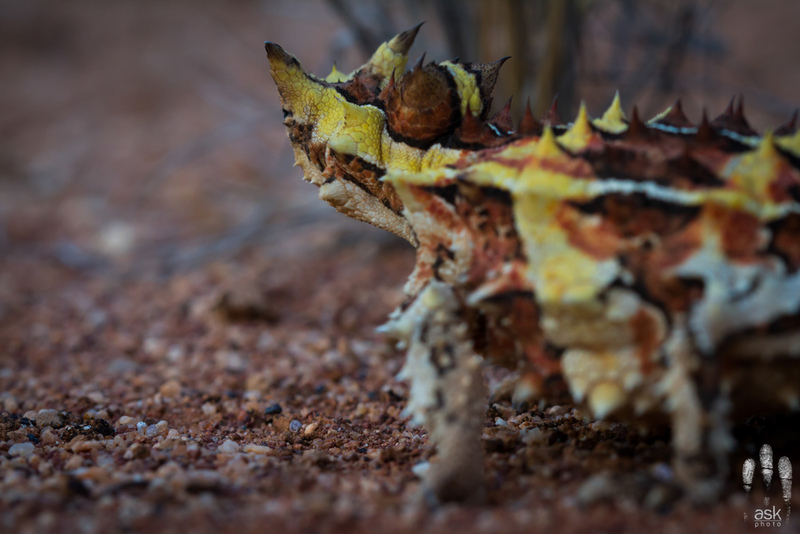 One paper, that I admit is not the most convincing, suggests another adaptation that thorny devils have to their arid home: they may pee on their eggs to keep the eggs moist. Such a cool lizard! Thurlga Station, South Australia, 2012. Photo by Angus Kennedy. I thought I'd end with a picture I found online. Thorny devils are quite dramatic looking, especially head-on, but I've never seen them look quite as terrifying as in this artificially-coloured image of a thorny devil skull overlayed onto an image of its head, taken from this website. The thorny devil at its most terrifying, courtesy of digimorph.org. In his book "Biology and Evolution of Australian Lizards", Allen Greer sorted the lizards I study, the genus Ctenophorus, into different groups based on where they live: those that live in burrows, those that live in rock crevices, and those that live in vegetation. Looking at the phylogenetic relatedness of the Ctenophorus dragons, there are two groups of each: two groups of burrowers, two groups of rock-dwellers, and two groups of vegetation-dwellers. I thought it'd be fun to put up pictures and descriptions of all these groups, since I have a large pile of pictures from my fieldwork. These are my posts so far: Rock-dwellers #1, Rock-dwellers #2, Burrowers #1, Burrowers #2, and Vegetation-dwellers #1. This last group of Ctenophorus dragons are known as the military dragons. I don't know why, maybe because their patterns are full of stripes. They are also the largest group of Ctenophorus, with seven species. They're all quite small, weighing around 10 grams or less, and are long-legged sprinters. They don't shelter anywhere in particular, so they use a combination of their speed and any available vegetation to hide from predators. During my PhD, I deliberately went after two species, and we came across a third coincidentally while looking for other dragon species. The two species in this group that I needed for my PhD were the mallee military dragon (Ctenophorus fordi) and the central military dragon (Ctenophorus isolepis). These two lizards are almost the exact same. They are quick, skittish lizards that are always on the flat ground. They never perch on branches, climb trees, or sit on top of bushes as other dragon lizards often do. They do everything - bask, hunt, mate, etc. - on solid ground. They also have a preferred habitat type, spinifex, and are so closely associated with spinifex that we called them the spinifex dragons. Spinifex is a famous type of grass here in Australia, famous mostly because it is basically a clump of outwards-pointing spears. I vividly remember my volunteers trying to catch mallee military dragons by hand; I had horrible visions of them poking their eyes out on the spinifex as they dove for dragons. The dragons use this to their advantage. If they're scared, they dive into a dense spinifex bush, which is basically an impenetrable fortress of spikes! The immense spikiness of a spinifex plant. Mulga Park Station, Northern Territory, 2012. Photo by Angus Kennedy. There were a few key differences between the mallee and central military dragons. First, the mallee military dragon was extremely abundant. We broke all records for single-day lizard catching with this species when, on the very last day of my 2012 field season, we caught 32 mallee military dragons between noon and 5 p.m. That is a lot of dragons! On the other hand, central military dragons are only moderately abundant. It took us two days to catch the same number of central military dragons as we caught mallee military dragons in half a day. This is still much more abundant than any other dragon species. That number of dragons would usually take us 4-6 days to catch, and with the rusty dragon it took three weeks! Central military dragons are also about double the size of mallee military dragons. Mallee military dragons prefer their spinifex to be under the shade of a canopy of mallee trees, whereas central military dragons like their spinifex exposed, with no trees in sight, like in the picture above. An additional difference is that central military dragons are sexually dimorphic, meaning that the males and females look different, while mallee military dragons are sexually monomorphic, meaning both sexes look the same. In the case of the central military dragon, this means that the male has a heck of a lot more black on him than the female, and has a more complex pattern. Male and female mallee military dragons look almost identical. There is no sexual dimorphism in this species, except for some extra black markings on the underside of the male. A male central military dragon (Ctenophorus isolepis). Mulga Park Station, Northern Territory, 2012. Photo by Angus Kennedy. A female central military dragon (Ctenophorus isolepis). Mulga Park Station, Northern Territory, 2012. Photo by Angus Kennedy. A male mallee military dragon (Ctenophorus fordi). Gluepot Reserve, South Australia, 2011. Photo by Tobias Hayashi. A female mallee military dragon (Ctenophorus fordi). Gluepot Reserve, South Australia, 2011. Photo by Tobias Hayashi. While looking for claypan dragons in southwest Western Australia, we came across a few spotted military dragons (Ctenophorus maculatus). This species is very similar to the other two military dragons, but it doesn't live in spinifex. Instead, they seemed to like areas that were open, but with short woody plants all over the place. They also didn't seem to be nearly as common as the other two, but maybe that was just because we weren't looking. A female spotted military dragon (Ctenophorus maculatus). near Lake Cronin, Western Australia, 2013. Photo by Angus Kennedy. Those are the three members of this group of vegetation-dwellers we came across during my fieldwork. Of the other four, only one is widespread and well known. The lozenge-marked dragon (Ctenophorus scutulatus) is the largest member of this group and is found over a large area of Western Australia just north of Perth. The other three species, the long-tailed military dragon (Ctenophorus femoralis), the rufus military dragon (Ctenophorus rubens), and McKenzie's dragon (Ctenophorus mckenziei) are all very poorly known critters. They're all restricted to small areas of remote habitat: the former two halfway up the coast of Western Australia, and the latter on the Nullabor plain. McKenzie's dragon also has the unfortunate distinction of being endangered. In his book "Biology and Evolution of Australian Lizards", Allen Greer sorted the lizards I study, the genus Ctenophorus, into different groups based on where they live: those that live in burrows, those that live in rock crevices, and those that live in vegetation. Looking at the phylogenetic relatedness of the Ctenophorus dragons, there are two groups of each: two groups of burrowers, two groups of rock-dwellers, and two groups of vegetation-dwellers. I thought it'd be fun to put up pictures and descriptions of all these groups, since I have a large pile of pictures from my fieldwork. These are my posts so far: Rock-dwellers #1, Rock-dwellers #2 Burrowers #1, Vegetation-dwellers #1. This second group of burrowers is awesome! Two of the dragons in this group are absolutely spectacular in terms of colour and behaviour, and the other two are mysterious beasts that are little known, rarely seen dwellers of Australia's most unforgiving habitat: salt lakes. They all dig cute little burrows and duck into them if they feel threatened. They are among my absolute favourite things to chase, which is great because this is the only group that we went chasing all three seasons of fieldwork. We started off chasing painted dragons at the very beginning of my very first field season and we ended my very last field season chasing claypan dragons over two years later. Painted dragons live up to their name. They are gorgeous! The males have brightly coloured heads that are blue, red, orange or yellow, along with a beautifully coloured and intricately patterned backs. The females are also quite intricately patterned, but they are not brightly coloured like the males. This is one of the first species we chased back in September 2011, and we had so many problems! It was a huge challenge just to catch one, and often it took three of us all surrounding the same tree to get a lizard. The trouble we were having had me worried for the rest of my fieldwork. Would we be able to catch enough lizards for my project to work? We needn't have worried. The problem wasn't that that painted dragons are hard to catch, it was that we sucked at catching painted dragons! By 2012 we'd had a lot of practice, and we were hoovering them up. It turns out painted dragons are among the easiest dragons to catch, owing partially to their habit of sitting conspicuously on the tops of bushes. Male painted dragon, Ctenophorus pictus. Turlga Station, South Australia, 2012. Photo by Angus Kennedy. Female painted dragon, Ctenophorus pictus. Turlga Station, South Australia, 2012. Photo by Angus Kennedy. Who knows why they call these things claypan dragons. They don't live in claypans, which are basically dried-up ponds. They live in salt pans, which are basically dried up salt lakes. When it's wet in the Australian scrub, like it was when we were looking for these guys in October 2013, they live on the salt crust around the edges of filled salt lakes. It's a very narrow strip of land, and makes their suitable habitat almost two-dimensional. Claypan dragons have a reputation for being hard to find. There are few records of them in the Atlas of Living Australia and almost nothing about them in the published literature. Maybe they have this reputation because people keep looking for them in claypans, because we had no troubles! Before my fieldwork I was worried that we'd have a lot of problems finding these guys. As it turns out, we came across them completely by accident while visiting a tourist spot before even starting our search in earnest! We did have trouble finding lakes where they lived. We visited a lot of lakes where we'd walk all the way around the lake and not find a sign of the dragons. However, when we visited a lake and found one, we'd find another, and then another, etc. They live in impressively high densities where they do live, it just seems that they're picky about which lakes they live around. Someone should use science to figure out why! Male claypan dragon, Ctenophorus salinarum. Varley, Western Australia, 2013. Photo by Angus Kennedy. Female claypan dragon, Ctenophorus salinarum. Varley, Western Australia, 2013. Photo by Angus Kennedy. These critters live in the middle of absolute nowhere. They was discovered by accident in 1996 when a vehicle full of scientists became stuck in the mud on the edge of Lake Disappointment. Lake Disappointment is so named because if you are wandering, lost and dehydrated, in the desert and see Lake Disappointment in the distance, you will think that you're saved. You will be wrong, disappointed, and more likely than not you will shortly be dead. Lake Disappointment is a salt lake and no one's saviour, except perhaps for the Lake Disappointment dragon's. Due to their remoteness we did not go after this dragon during my fieldwork. It's not completely clear that the bicycle lizard belongs in this group. When Greer wrote his book back in the 1980's, he included them in the burrowers, but Melville (2001) places them among the vegetation dwellers. Since the vegetation dwellers don't have a burrow or crevice close by for security, they tend to be long-legged, dainty things that are very good at taking off at high speed. The bicycle dragon certainly fits this bill. They're called bicycle dragons because, when scared, they lift up into a T-rex position, pin their front legs against their chest and rotate their back legs as if they're peddling a bike. This gets them far, fast. But back to the burrowing. According to the most recent phylogeny (Chen et al., 2012), bicycle dragons are part of this group of burrowers. However, Chen and her colleagues can't be completely sure of this relationship, according to their statistics all they can say is that the bicycle lizard is probably part of this group (thanks to JP for clarifying the meaning of phylogenetic probabilities). Of the four phylogenies published on Ctenophorus over the past fifteen years, none have placed the bicycle dragon in the same place. So the genetics, at the moment, are inconclusive. What about practically? Do bicycle dragons actually dig burrows? Greer, in his 1989 book "Biology and Evolution of Australian Lizards", says yes. However, others since then have said no, mostly citing personal comments and observations (eg. Meville et al., 2001; Thompson & Withers, 2005). During my fieldwork, we probably caught about forty bicycle lizards, and had another twenty or so escape on us. Not a huge sample size, but not small either. The vast majority took off as I described above. One individual ducked into a burrow. Compare this to the other burrowers we caught: the painted dragon, claypan dragon, and central netted dragon. The painted dragon would duck into a burrow probably around 80% of the time, the rest of the time taking off running or ducking under a bush. The claypan and netted dragons, which live in more exposed habitats than the painted dragon, ducked into burrows close to 100% of the time. So are bicycle dragons burrowers? Maybe they're facultative borrowers, building burrows when it suits them. This is another question that science is a very useful tool for answering. Male bicycle dragon, Ctenophorus cristatus. Lake Hurlestone Conservation Reserve, Western Australia, 2013. Photo by Angus Kennedy. Female bicycle dragon, Ctenophorus cristatus. Lake Hurlestone Conservation Reserve, Western Australia, 2013. Photo by Angus Kennedy. Chen, I, Stuart-Fox, D., Hugall, A.F., and Symonds, M.R.E. 2012. Sexual selection and the evolution of complex colour patterns in dragon lizards. Evolution, 66-11:3605-3614. Greer, A.E. 1989. The biology and evolution of Australian lizards. New South Wales: Surrey Beatty and Sons. Melville, J, Schulte II, JA, and Larson, A. 2001. A molecular phylogenetic study of ecological diversification in the Australian agamid genus Ctenophorus. Mol Dev Evol., 291:339-353. In his book "Biology and Evolution of Australian Lizards", Allen Greer sorted the lizards I study, the genus Ctenophorus, into different groups based on where they live: those that live in burrows, those that live in rock crevices, and those that live in vegetation. Looking at the phylogenetic relatedness of the Ctenophorus dragons, there are two groups of each: two groups of burrowers, two groups of rock-dwellers, and two groups of vegetation-dwellers. I thought it'd be fun to put up pictures and descriptions of all these groups, since I have a large pile of pictures from my fieldwork. Here is my first post, on the first group of rock-dwellers. Here is my second, on the first group of burrowers. Here is my third, on the first group of vegetation-dwellers. Distributions of the six members of rock dragon group 2. The rusty dragon (Ctenophorus rufescens) is in dark blue; the ochre dragon (Ctenophorus tjantjalka) is in light blue; the peninsula dragon (Ctenophorus fionni) is in purple; the red-backed dragon (Ctenophorus vadnappa) is in red; the tawny dragon (Ctenophorus decresii) is in green; and the border ranges dragon (Ctenophorus mirrityana) is in puke. Maps courtesy of the Atlas of Living Australia. There are some range-overlaps, so they are not completely allopatric. The most well-known overlap is between the red-backed and tawny dragons in and around Gammon Ranges National Park. However, a friend of mine who's doing her PhD on tawny dragons went looking for tawnies around the Gammon Ranges and couldn't find a single one, though she found many red-backed dragons. Another interesting overlap is just north of Marla on the Stuart Highway, were the ranges of the rusty and ochre dragons supposedly meet. If this is true, and both species are present there, it would be an excellent place to visit. Both species otherwise inhabit very harsh, remote terrain and are therefore very difficult to come across in the wild (despite being very common in the remote areas where they live). However, I have my doubts about this overlap because, as with the netted dragons, there are some glaring inaccuracies in this map. For example, Adelaide has clearly erroneous (or escapee) records of peninsula and rusty dragons. There are records of tawny, rusty and red-backed dragons on the Eyre Peninsula that, to me, are clearly misidentified peninsula dragons. However, there are other, more insidious inaccuracies. The purple dot at the very northern tip of Lake Torrens (the northernmost purple dot) looks like it could be just on the edge of the range of the peninsula dragon. Actually, the animals that live there are red-backed dragons that have been misidentified. I know this because a herpetologist at the South Australia Museum looked at those specimens and told me they were misidentified, and also because I went there and collected red-backed dragons at that exact spot! Misidentifications like this make it difficult to know where the precise contact zones are between the different species. The tawny dragon is the most well known of this group of rock dragons and a popular research subject. This is most likely just circumstance, it's found around the most populated area of South Australia (Adelaide). The tawny dragon comes in three distinct lineages: a southern lineage (Kangaroo Island and the Adelaide Hills), a central lineage (southern Flinders Ranges) and a northern lineage (northern Flinders Ranges). The central lineage comes in distinct colour morphs, each of which seems to have a slightly different personality. The northern lineage is the one that no-one, including my friend who studies them, has heard from recently, and as a result no-one knows much about this lineage. We caught our tawny dragons from the central lineage, around Burra and Hawker, South Australia. Chasing lizards near Burra was a surreal experience for many reasons, not the least of which was that we were wandering through rolling, grassy sheep pastures that looked more like something out of pastoral England or New Zealand than somewhere you might expect to find a semi-arid rock-dwelling dragon. But there they were, basking on rocks in the dried creek beds in between rolling hills. One day I will have to do a post of just pictures and stories from Burra. Male Tawny Dragon (Ctenophorus decresii). Burra, South Australia, 2011. Photo by Tobias Hayashi. Female Tawny Dragon (Ctenophorus decresii). Mount Remarkable National Park, South Australia, 2011. Photo by Angus Kennedy. Male red-backed dragons are spectacular. Their backs are a vividly patterned mix of red, blue and green, and their throats are a gorgeous yellow. We visited the westernmost known population of these guys, at the northern tip of Lake Torrens, and we also visited another spot in the core of their distribution, near Gammon Ranges National Park. This species was one of the first rock dragons we went searching for, and gave us our first taste of our most hated habitat type: granite rock outcrops. Huge granite boulders are a terrible thing to try to walk across all day, let along chase tiny, fast lizards across. They are rough, sharp and sometimes even unstable, and have impressively worn down my brand-new heave-duty hiking boots. It was also at Lake Torrens, chasing red-backed dragons, that volunteer Mitch invented and perfected the art of noosing lizards out from under boulders. Male Red-backed Dragon (Ctenophorus vadnappa). Arkaroola Station, South Australia, 2011. Photo by Angus Kennedy. Female Red-backed Dragon (Ctenophorus vadnappa). Arkaroola Station, South Australia, 2011. Photo by Angus Kennedy. The peninsula dragon, unfortunately, also lives on granite outcrops. This species is found all over the Eyre Peninsula, and also along the west coast of Lake Torrens. It gets more and more colourful as you move away from the coast (a similar thing happens with the ornate dragon). Near the coast, males are mostly black and grey, but as you move inland they gain oranges, yellows and blues. We did our peninsula dragon chasing near the northwestern-most limit of their range, in between lakes Edward and Gairdner. Both of these are salt lakes, lest anyone get the impression there is a drop of fresh water around this area, and the region is impressively dry and foreboding. I remember hot, lonely days (because each volunteer took their own section of terrible granite outcrop) wandering around searching for lizards, not seeing any for hours. But for some reason I had fun the whole time. Something about the landscape, the emptiness, the adventure and the challenge made it all worthwhile. Male Peninsula Dragon (Ctenophorus fionni). Kokatha Station, South Australia, 2012. Photo by Angus Kennedy. Female Peninsula Dragon (Ctenophorus fionni). Kokatha Station, South Australia, 2012. Photo by Angus Kennedy. The ochre dragon is extremely poorly known. This dragon lives in some of the most remote, arid country in Australia, not far from where the Australian weather bureau had to add new colours to their heat map after the temperature went off the charts, literally. They were completely new to science in the 1970's and officially described as a new species in 1992. The locations we visited were part of the southern ochre dragon population, which was only discovered in 1995. The cattle rancher who told us where to find them and how to get there (and helped us fix a flat tyre) was the same one who accompanied the guy who found them in the first place. He even claimed to have caught the first individual! The southern ochre dragons differ from the northern ones in that the males are patternless and powder blue (as opposed to grey). Both populations have salmon (or ochre) on their flanks. Male Ochre Dragon (Ctenophorus tjantjalka). Anna Creek Station, South Australia, 2012. Photo by Angus Kennedy. Female Ochre Dragon (Ctenophorus tjantjalka). Anna Creek Station, South Australia, 2012. Photo by Angus Kennedy. The rusty dragon is almost as poorly known as the ochre dragon, though it has been known to science for a lot longer. This species is the only member of rock dragon group 2 in which males and females look similar, to the point where I couldn't tell a male from a female for the longest time. Males are not gaudily coloured like in all the other species, instead they are brown and tan like the females. This was also the most challenging species of rock dragon for us to catch. They are fast devils, with longer legs and tails than the other species, and would hide in the most impenetrably narrow crevices. Tearing across granite boulders in the midday heat day-in, day-out, while catching very little was a frustrating endeavour, especially in a location where the closest pub was 200km away by dirt road, and the closest grocery store over 500km! Male Rusty Dragon (Ctenophorus rufescens). Victory Downs Station, Northern Territory, 2012. Photo by Angus Kennedy. Female Rusty Dragon (Ctenophorus rufescens). Mulga Park Station, Northern Territory, 2012. Photo by Angus Kennedy. The border ranges dragon was only described last year! Up until then, it was thought to be a distinct population of the tawny dragon. This is the only member of rock dragon group 2 that is not native primarily (or exclusively) to South Australia. They are endemic to far western New South Wales, where they are endangered. They are also the only species of rock dragon that I have never seen in the wild. Their endangered status means that it would be very unwise of me to go and collect some for my research. Luckily, they are common in Mutawinji National Park, so I should be able to go out at some point and check them out in the wild. However, an even easier option than driving 13 hours into the desert is to head to Sydney. The Taronga Zoo has a male on display in their reptile house! So if you want to see Australia's newest dragon species AND Australia's newest endangered species, it's really very easy, and you can admire a baby komodo dragon at the same time. Male Border Ranges Dragon (Ctenophorus mirrityana). Taronga Zoo, Sydney, New South Wales, 2014. I don't have a picture of a female border ranges dragon, so instead here's a picture of a baby komodo dragon that you can visit along with the male border ranges dragon at the Taronga Zoo. Sydney, New South Wales, 2014.